Back in March at GTC 2015, NVIDIA announced the first member and flagship of their Maxwell 2 generation of Quadro cards, the Quadro M6000. 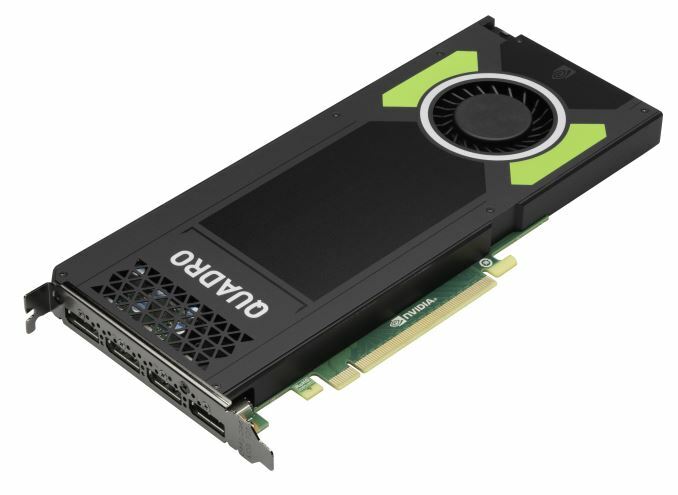 Packing a fully-enabled GM200 GPU and 12GB of RAM, M6000 signaled an interesting shift from NVIDIA on the high-end of Quadro, with the company shipping what amounted to a “pure” graphics card as opposed to a jack-of-all-trades type card as they typically do at the high-end. Meanwhile, although the M6000 was the first Maxwell 2 based Quadro card to launch, it was not the first Maxwell 2 GPU to launch. NVIDIA has launched GM204 and GM206 late last year and early this year respectively, and of course Maxwell 1 ended up in the Quadro K2200 and a couple of other cards. As a result we have been expecting NVIDIA to refresh the rest of the Quadro lineup with Maxwell 2 after the release of the M6000, and this week at SIGGRAPH NVIDIA is doing just that with the release of the Quadro M5000 and Quadro M4000. We’ll start things off with the Quadro M5000. While NVIDIA has not announced the GPU for these new products, we believe the M5000 to be based on GM204, given the CUDA core and memory bus configuration. By those standards M5000 would be a fully enabled GM204 card, featuring all 2048 CUDA cores and the full 256-bit memory bus, essentially making this the Quadro version of the GeForce GTX 980. Curiously, the M5000 features DRAM soft ECC support, allowing for error correction on the DRAM. Previous 5000-series Quadro cards have also included this feature, but at a GPU level NVIDIA typically reserves this feature for their highest-tier GPUs. With that said, as it’s software based and we’ve seen NVIDIA enable it in a Kepler-based GK104 product before (Tesla K10), for the moment we believe that they have gone ahead and enabled it for this GM204 product, rather than outfitting the card with GM200. Paired up with the GM204 is 8GB of GDDR5 clocked at a slightly more conservative 6.6GHz. Based on these specifications it’s not clear whether NVIDIA is using 16 4Gbit chips or 8 8Gbit chips, as the latter are now available though still fairly rare (M6000 by comparison used 24 4Gbit chips). In any case this is the same amount of RAM as the previous Quadro K5200 shipped with, indicating that NVIDIA is targeting the same market segment as before. As for GPU clockspeeds, as is usually the case NVIDIA has not published specific clockspeeds, but in their press materials they have the card’s FP32 performance listed at 4.3 TFLOPs. This would put the maximum GPU clockspeeds at around 1.05GHz, though as this is a GPU boost product we don’t know the base clockspeeds at this time. NVIDIA has also published the power information for this card, and like its Kepler-based predecessor it’s a 150W card. A 150W TDP allows M5000 to more easily work in lower power workstations where only a single 6-pin PCIe power connection is available, and is actually a bit lower power than comparable desktop GeForce products. Though as a result we expect that shipping clockspeeds are below 1GHz. Meanwhile NVIDIA has typically gone with dual-slot blowers on their 150W Quadro cards, and M5000 will be no exception. The card is shipping with what appears to be a new blower and shroud design – and one I suspect is all plastic like the Quadro K5200’s – mimicking the original metal shroud of the M6000. At any rate this is a full size card, meaning it measures 10.5” long like NVIDIA’s other high-end cards. Finally, much like the M6000, the overall importance of a Maxwell release is two-fold for NVIDIA. First and foremost of course are the performance improvements from Maxwell, which achieves much better performance per CUDA core and much better energy efficiency than the preceding Kepler parts, so M5000 should achieve even better real-world performance than its already substantial on-paper specifications indicate. However the other significant benefit here is that the switch to Maxwell means that the Quadro cards gain Maxwell’s newer display controller and NVENC blocks, allowing the M5000 to drive four 4K displays – twice as many as K5200 – and real-time HEVC encoding. Also launching today and below the M5000 is the M4000. This appears to be another GM204 design, forgoing some of GM204’s CUDA cores in exchange for lower costs, performance, and power consumption. Like the M5000 we don’t have the clockspeed information for the card, but we do know it features 1664 active CUDA cores, making it analogous to the GeForce GTX 970. Also like the M5000 this features 8GB of VRAM – twice as much as the K4200 – this time clocked at 6GHz, however without the soft ECC support of the higher-end Quadro cards. Compared to the M5000 the TDP on the M4000 is down by 30W to 120W. The previous Quadro K4200 was a 105W card, so power consumption is up slightly, but in turn the M4000 features the Maxwell family improvements and more CUDA cores than the K4200. The card is rated for 2.6 TFLOPs of FP32 performance, which puts the maximum clockspeed at around 780MHz, so we expect that performance will be greatly improved over the K4200. Meanwhile like past Quadro 4000-series cards, the M4000 is a single slot design. To the best of our knowledge this is a new PCB design for NVIDIA, and taking advantage of the lower power requirements brings the length of the card down to 9.5”. In order to get everything down a single slot NVIDIA has done away with the DVI port – a first for the 4000 series – making M4000 a 4x DisplayPort design. As we mentioned with M5000, the Maxwel display controller improves 4K support to allow 4 such displays off of a single card, and this is a scenario NVIDIA is clearly looking to enable with the M4000. Finally, as is usually the case for NVIDIA, the company is not publishing any official prices for these cards, leaving pricing up to their partners and vendors. That said, at this point we expect pricing to be similar to the Quadro K5200 and K4200, which would put street prices on the cards at around $2000 and $1000 for the M5000 and M4000 respectively. 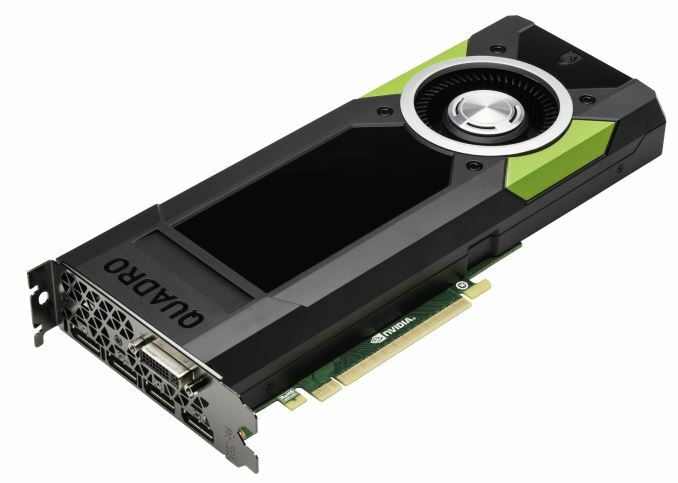 Along with the release of their latest Quadro cards, NVIDIA is also announcing a new software suite at SIGGRAPH: DesignWorks. The latest Works project, DesignWorks, is partially a collection of new software and partially a branding exercise for the company. 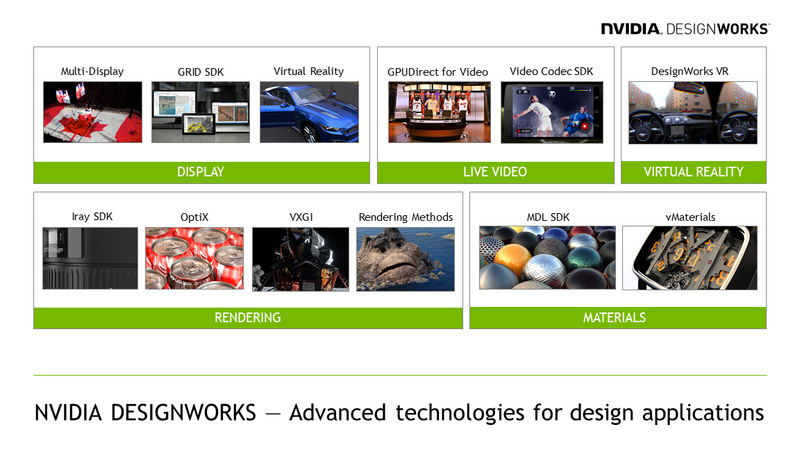 Following in the footsteps of GameWorks for game development, NVIDIA is collecting most of their tools and libraries for professional graphics development under the DesignWorks brand, and going forward will be releasing new tools under this brand as well. Along with collecting previous disparate tools like Iray and OptiX, the announcement of DesignWorks also marks the introduction of some new tools for NVIDIA. Of particular note here is NVIDIA vMaterials, a library of digitized, real world materials for use in applications that can interface with NVIDIA’s Material Design Language, MDL. Also premiering with DesignWorks is a version of NVIDIA’s VR technology optimized specifically for professional use, aptly named DesignWorks VR. Meanwhile NVIDIA’s technology focus for the DesignWorks launch is on Physically Based Rendering (PBR), a realistic rendering technique the company has been promoting for much of the last year now. PBR is very GPU intensive – always a plus for someone in the business of selling GPUs – but in turn is designed to offer more photo-realistic results (but not necessarily more accurate results) by focusing on simulating the properties of the materials of the surrounding world itself. This focus on PBR goes hand-in-hand with the NVIDIA vMaterials announcement in particular, as a big part of enabling PBR is creating the material representations themselves. Finally, as part of their PBR push over the past year, NVIDIA has been showing off various images under the Real or Rendered tagline. 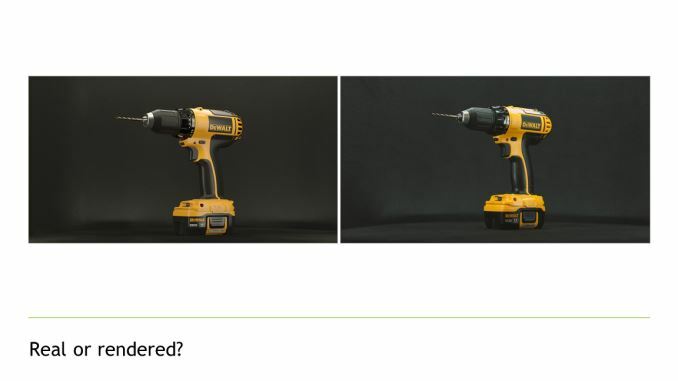 For SIGGRAPH the company has put together an admittedly impressive render of a DeWalt drill, which is close to the real thing, though not identical to it.